47 Brand 60% cotton, 40% polyester, drawstring-hooded, soft grey sweatshirt with hand-warmer pocket and ribbed detail at end of sleeves and bottom. Large half-brown, half-white 'B' with cardinal outline on front. 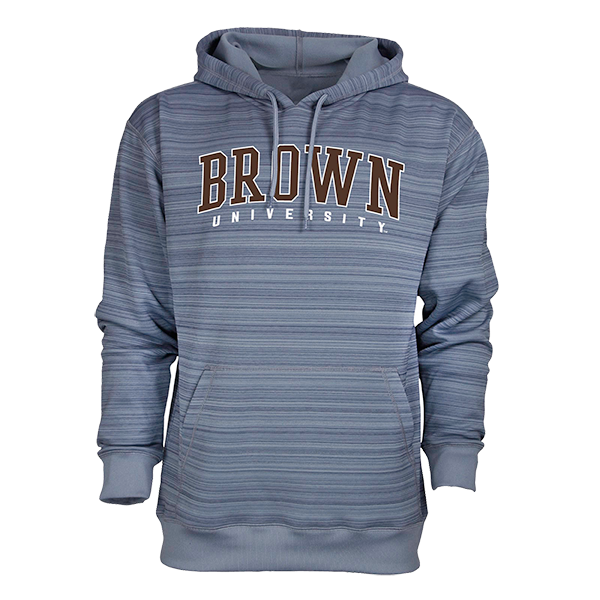 Please select option for 47 Brand Grey B Hooded Sweatshirt - $55.99. Please select option for Alternative Apparel Challenger Hoodie. Champion 50% cotton, 50% polyester, full-zippered, drawstring hooded, grey sweatshirt with hand-warmer pockets. 'BROWN' in brown sewn-on fabric letters with white fabric outline above embroidered cardinal, black, and white Crest. 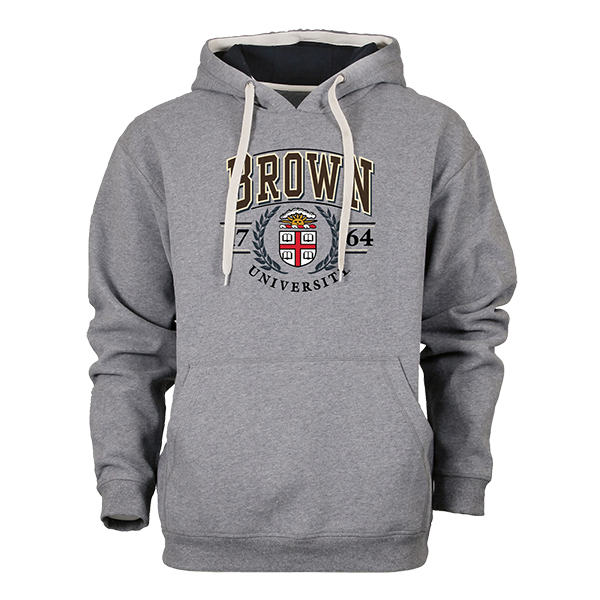 Please select option for Champion Grey Crest Zip Hooded Sweatshirt - $54.99. 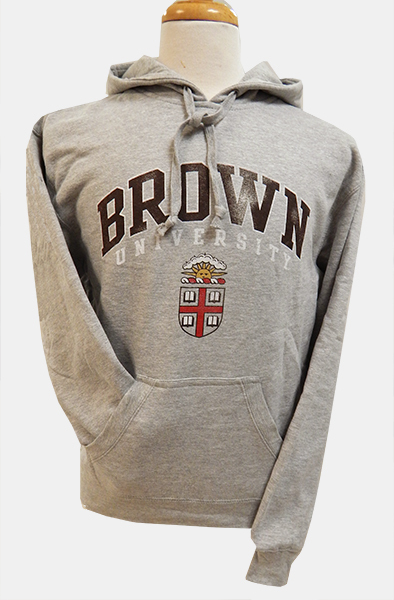 Champion 100% polyester, grey sweatshirt with cardinal shoulders and hood, front pocket. 'BROWN' imprinted in cardinal block letters with black outline, above 'EST. 1764' in cardinal block lettering on black background, next to Crest in grey, cardinal, black and white. 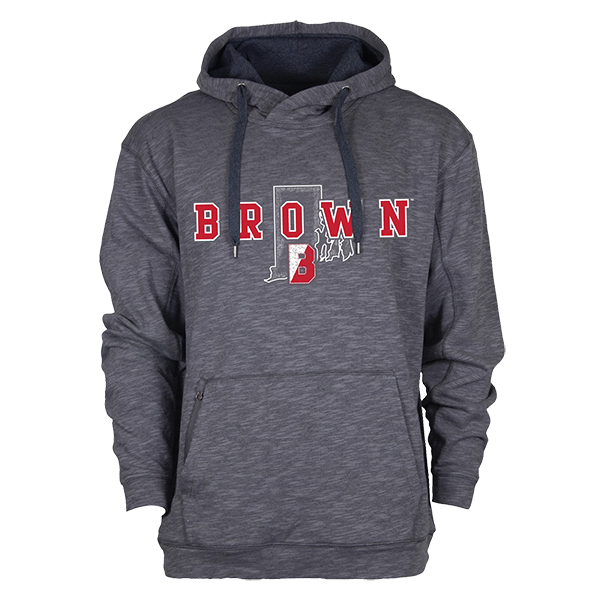 Please select option for Champion Grey/Cardinal Hooded Sweatshirt - $49.99. 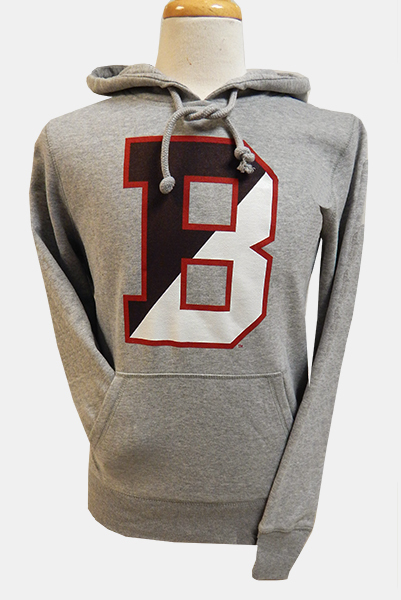 Champion Maroon Hooded Sweatshirt with 'Brown' in white block lettering and 'University' in grey block lettering. 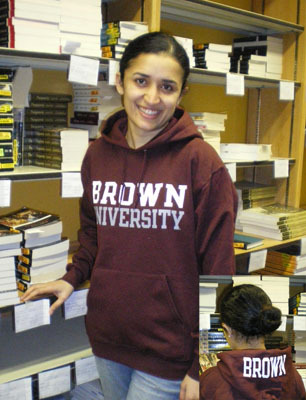 'Brown' imprinted on hood in white block lettering (see inset). 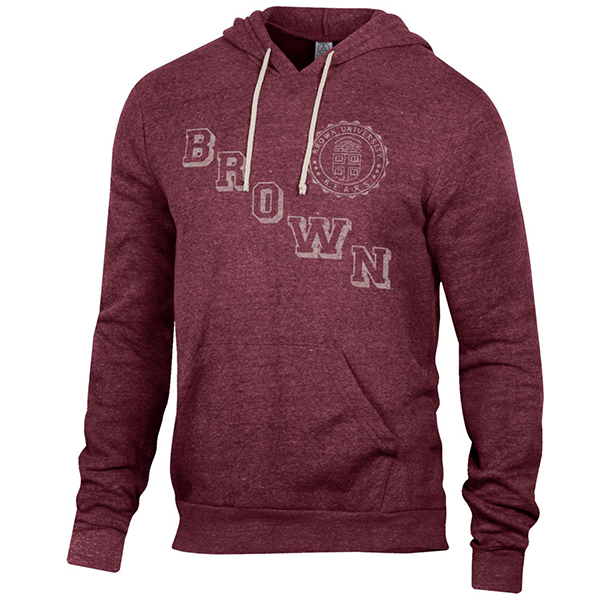 Please select option for Champion Maroon Hooded Sweatshirt - $49.99. Please select option for Champion Men's Fleece Pullover Hoodie. Champion Original Reverse Weave 81% cotton body, 19% polyester body, 99% cotton, 1% polyester ribbing, drawstring-hooded, light-grey sweatshirt with hand-warmer pocket. 'BROWN' imprinted in brown with brown outline across the front. Please select option for Champion RW Grey Hooded Sweatshirt - $64.99. 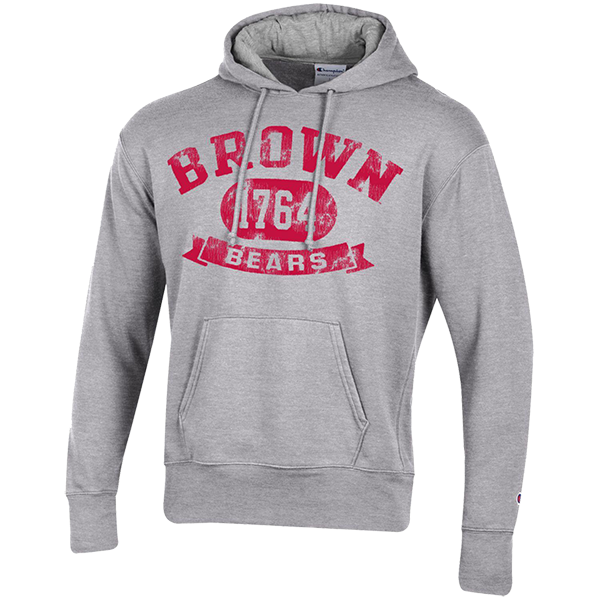 Champion 50% cotton, 50% polyester hooded sweatshirt with hand-warmer pocket with sewn-on tackle-twill letters. 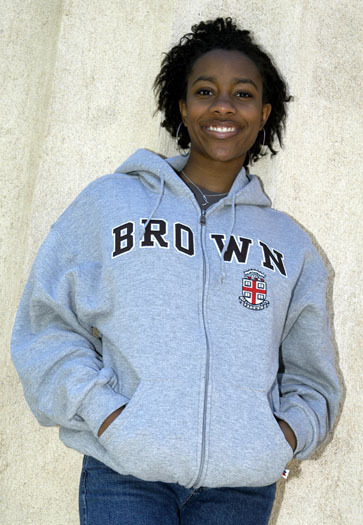 Brown Hood has 'BROWN' in sewn-on cardinal letters with white fabric outline. 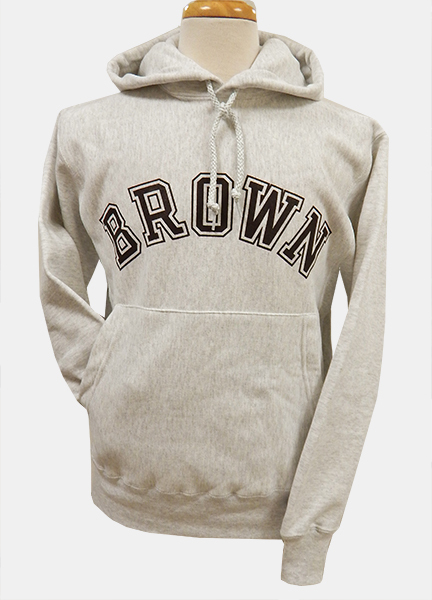 Charcoal Hood has 'BROWN' in sewn-on brown letters with off-white fabric outline. 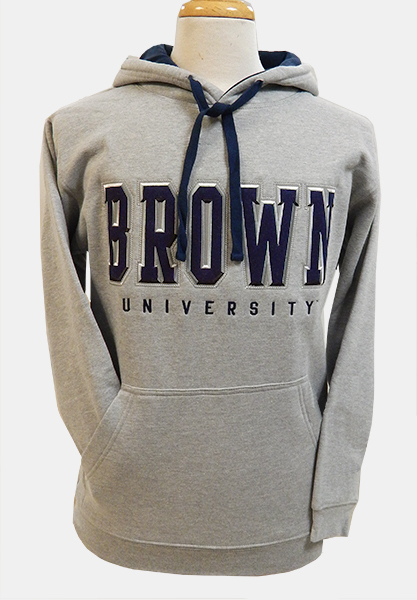 Navy Hood has 'BROWN' in sewn-on silver-grey letters with white fabric outline. Please select option for Champion TT Hooded Sweatshirts - $54.99. Gear 75% cotton, 25% polyester grey drawstring-hooded sweatshirt with hand-warmer pocket. Distressed imprint of 'BROWN' in brown with white outline, 'UNIVERSITY' in white, and red, brown, gold, and white Crest. --The printed design on this hoodie is meant to appear slightly-faded and worn - aka: Vintage. See design details in 2nd image. 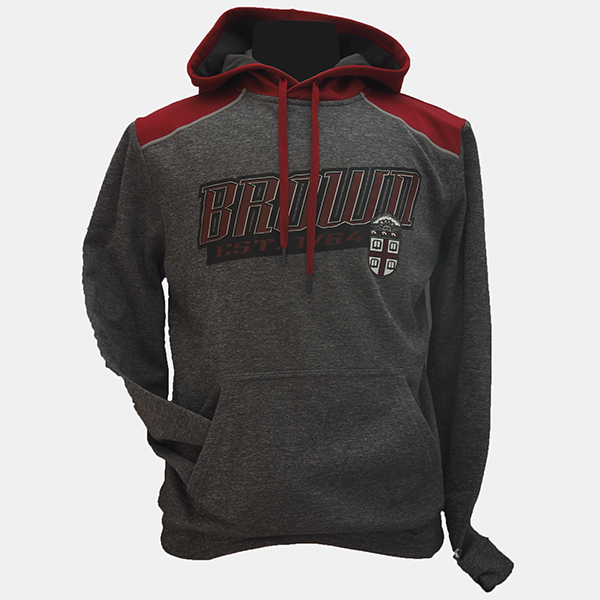 Please select option for Gear Grey Crest Hooded Sweatshirt - $49.99. 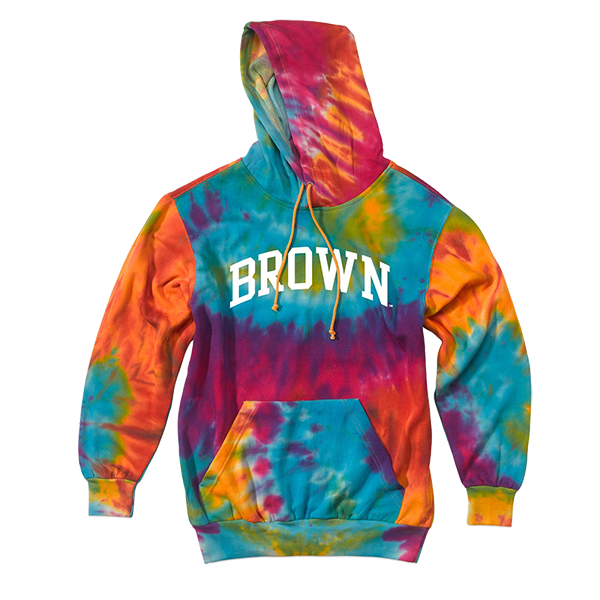 Please select option for MV Rainbow Tie Dyed Hoodie. 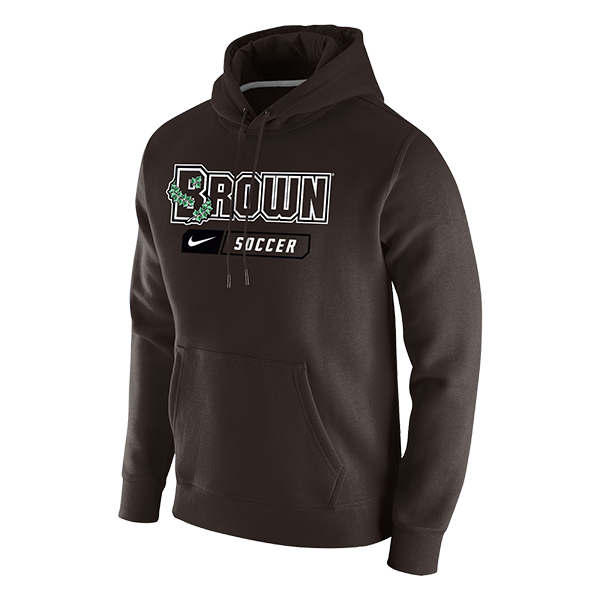 Please select option for Nike Club Fleece Pullover Hoodie - Brown or Dark Gray. 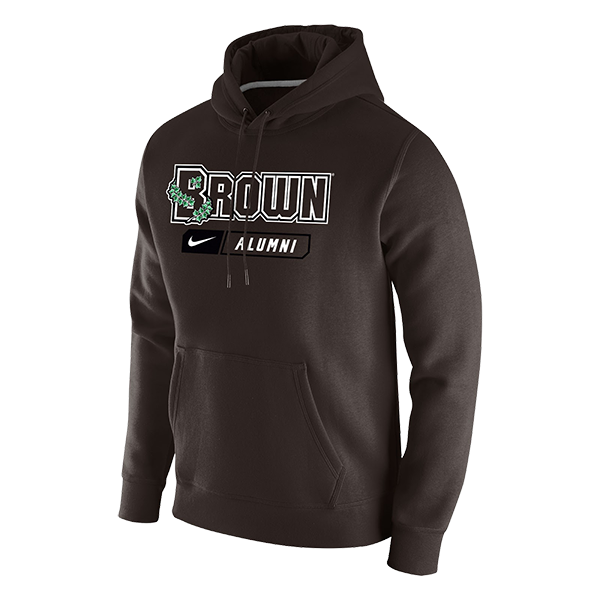 Please select option for Nike Men's Fleece Pullover Hoodie - Brown Athletics. 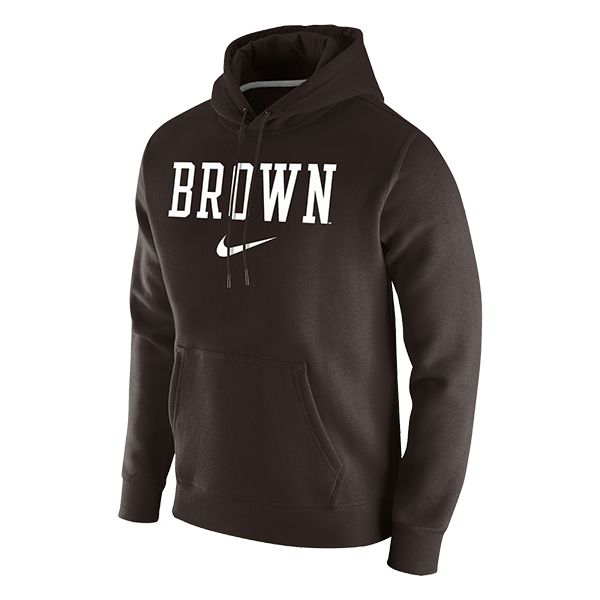 Please select option for Nike Men's Fleece Pullover Hoodie - Brown Baseball. Please select option for Nike Men's Fleece Pullover Hoodie - Brown Bears. Please select option for Nike Men's Fleece Pullover Hoodie - Brown Football. Please select option for Nike Men's Fleece Pullover Hoodie - Brown Gymnastics. 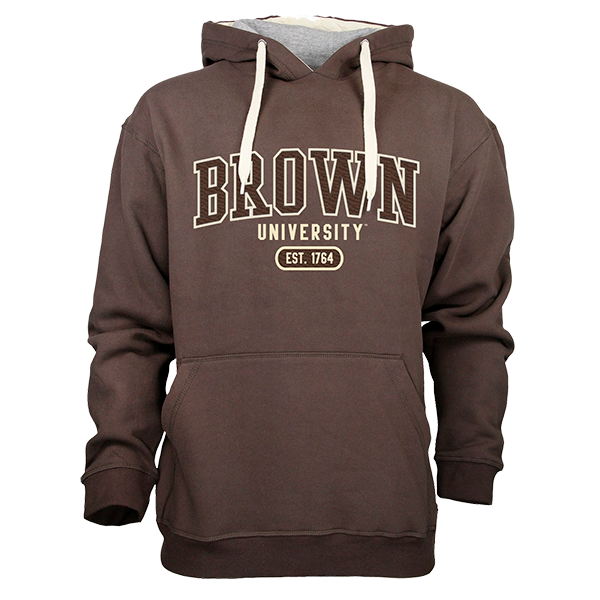 Please select option for Nike Men's Fleece Pullover Hoodie - Brown Hockey. 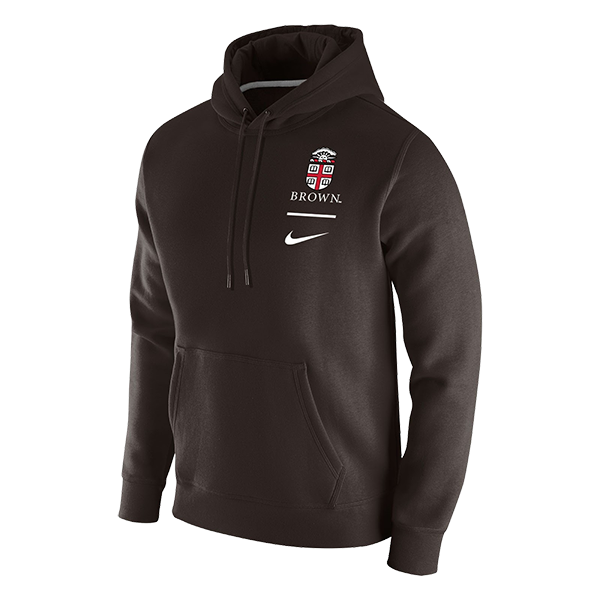 Please select option for Nike Men's Fleece Pullover Hoodie - Brown Lacrosse. Please select option for Nike Men's Fleece Pullover Hoodie - Brown Swoosh. Please select option for Ouray Evolution Hoodie - Black. Please select option for Ouray Evolution Hoodie - Steel. Ouray 55% premium sueded cotton, 45% polyester body, 100% cotton hood liner, off-white drawstring-hooded, grey sweatshirt with hand-warmer pocket. 'BROWN' in brown felt letters with off-white and black embroidered outline above cardinal, black, white, and gold embroidered Crest surrounded by embroidered charcoal wheat stacks, '17,' and '64' above 'UNIVERSITY' embroidered in charcoal. Please select option for Ouray Grey Crest Hooded Sweatshirt - $64.99. Ouray 60% cotton, 40% polyester, navy drawstring, navy lined hooded grey sweatshirt with hand-warmer pocket. 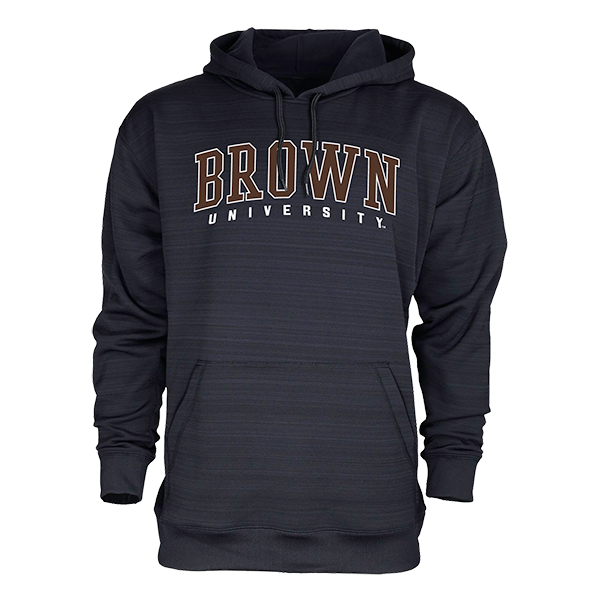 'BROWN' in large, navy felt sewn-on letters with grey and black embroidered outline on grey fabric above 'UNIVERSITY' embroidered in navy. Please select option for Ouray Grey Navy-Hooded Sweatshirt - $49.99. Please select option for Ouray Perls DLX Hoodie. Please select option for Ouray Rhythm Hoodie w/Split B. 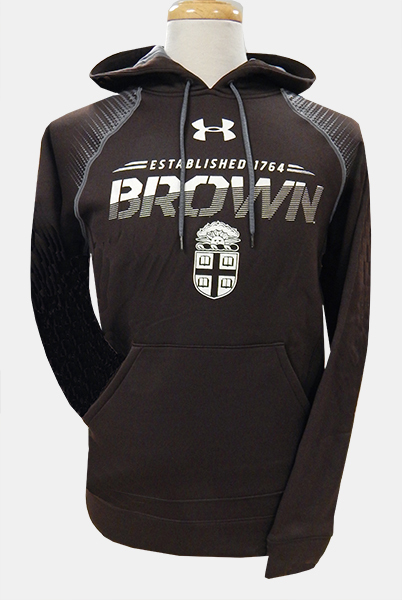 Under Armour STORM1, water-resistant, loose-fit, grey drawstring grey lined hood, brown sweatshirt with hand-warmer pocket has imprinted grey graphic design on shoulders with grey over-stitching. UA symbol imprinted in white above 'ESTABLISHED 1764' in white with white and silver bars above 'BROWN' in white and silver lines above Crest in white. 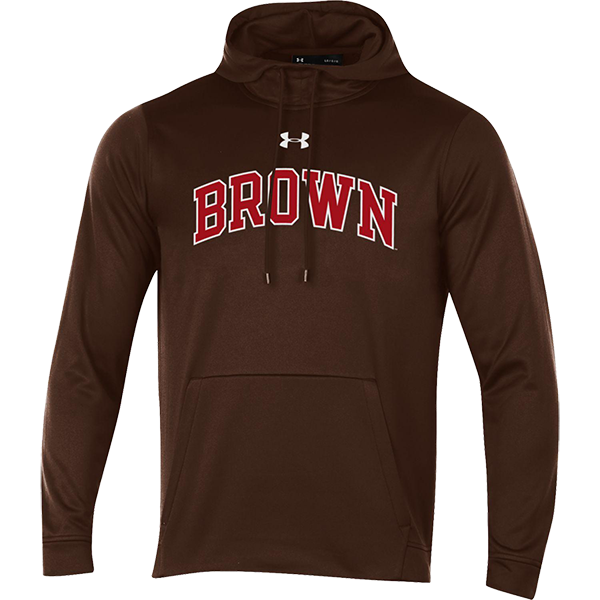 Please select option for Under Armour Brown Crest Hooded Sweatshirt - $84.99. Please select option for Under Armour Men's Armour Fleece Hoodie.